Sweden : Karen Kajsa Nilsdatter b. Naes Varmland 21 June 1836 or 3 July 1836 ?? Can anyone help me confirm that the Karen (Cajsa/Kasja) who married Johan F. Amundsen is the same one who was born 3 July 1836 in Huggenas Varmland ? I would love to solve this puzzle ?? can anyone help? Re: Sweden : Karen Kajsa Nilsdatter b. Naes Varmland 21 June 1836 or 3 July 1836 ?? A difficult one this one. Also, I have never seen Swedish or Norwegian birth dates re-calculated according to the different calenders. So I do believe if she was born on 21 June 1836 then she was more than likely born on that date. I think we should be looking for this date of birth. I'll keep looking for anything else. Yes it is a BIG problem for me If I can find both Karen ( Kajsa) then I would be able to exclude one of them ? Is there any place I could find a record to confirm Karen ( Kasja/ Caisa) date of birth? Any records you can think of that might show the 21 June 1836 Date ? 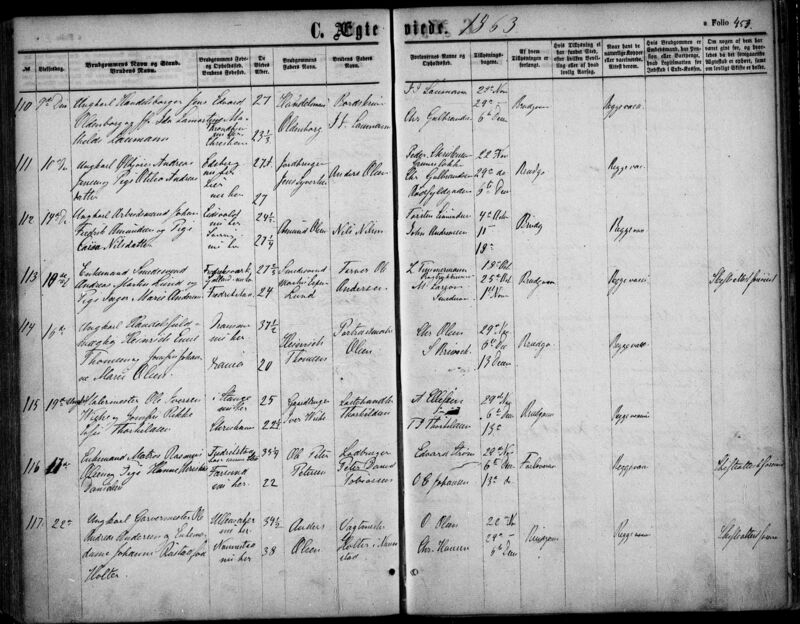 Yes, the 14 Dec 1863 Marriage record does show her father as Nils Nilsen- but I am not sure that is correct? Can you find any more info about this Karen? Perhaps the Banns would help ? There must be some record - I just cant think where to look? I have most of the records about the Karen(kajsa) born 3 July 1836- she moved to Hurum in 1855- as her father also moved there then. Nils Hansson Ringsfelt drown in the Fjord in 1861- so I thought perhaps Karen's brother Nils Nilsen (b.1843) was the witness at her wedding in place of her father? I know my internet helper Tommy - was the one who couldnt find Kajsa/Caisa - born 21 June 1836 -the only one he could find is the one born 3 July 1836- then he explained the different calendars etc.. Apparently in 1836 -there was 12 days difference between the 2 Calendars. I was just getting used to the Old Norwegian Genealogy site and then they changed it- I am sorry I am not very good at the new one..
As there seems nothing in Norway left to find apart from the banns I'll continue in Sweden. I'll see if I can find a bann somewhere. Yes, I think I have those records- Thanks. Karen's daughter Caroline Elise b. 19 July 1875 is my G grandmother. Her father is listed as Ole Nilsen- b. 1847 Hedmarken and I really need to confirm his parents etc also - I do not know much about him. I have a couple possible matches for him as he would be in Oslo in 1875 & there were several on the Census.. He is listed on Caroline's Birth, Marriage records so must have been in her life?? Caroline married Peter Bernhard Peterson/Pedersen-6 April 1896 • Paulos Menighet Olso Akershus Norway..Married under Karoline Elise Nilsen Father shown = Ole Nilsen Peter Petersen's father= klaudius Magnus Pedersen..
Maybe there might be more Karen ( kasja) information on any of the above records though? Looks like Torsten Linne____?? then next column- it says 4 Oct ?? Does this means anything ?? Is Varmskog in Naes Varmland ? I seem to have a DNA match with someone with this Nils in their tree? http://www.rootschat.com/links/01mjr/ - 4th from bottom. I think this is her actually. Everything seems to fit. Now to find her in Hurum Parish, which there are 2 of them.